This paper proposes a retributive argument against punishment, where punishment is understood as going beyond condemnation or censure, and requiring hard treatment. The argument sets out to show that punishment cannot be justified. The argument does not target any particular attempts to justify punishment, retributive or otherwise. Clearly, however, if it succeeds, all such attempts fail. No argument for punishment is immune from the argument against punishment proposed here. The argument does not purport to be an argument only against retributive justifications of punishment, and so leave open the possibility of a sound non-retributive justification of punishment. 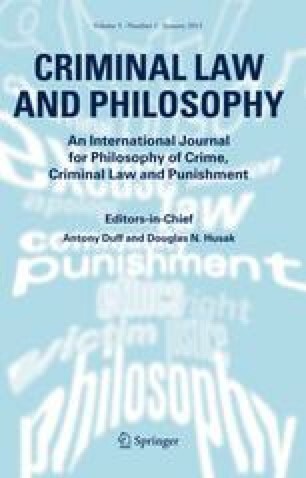 Punishment cannot be justified, the paper argues, because it cannot be demonstrated that any punishment, no matter how minimal, is not a disproportionate retributive response to criminal wrongdoing. If we are to hold onto proportionality—that is, proportionality as setting a limit to morally permissible punishment—then punishment is morally impermissible. The argument is a retributive argument against punishment insofar as a just retributive response to wrongdoing must be proportionate to the wrongdoing. The argument, that is, is concerned with proportionality as a retributive requirement. The argument against punishment is set out on the basis of a familiar version of the ‘anchoring problem’, according to which it is the problem of determining the most severe punishment to anchor or ground the punishment scale. To meet the possible criticism that we have chosen a version of the anchoring problem particularly favourable to our argument, various alternative statements of the anchoring problem are considered. Considering such statements also provides a more rounded view of the anchoring problem. One such alternative holds that the punishment scale must be anchored not just in the most severe punishment, but in the least severe punishment as well. Other alternatives hold that it is necessary and sufficient to anchor the punishment scale in any two punishments, neither of which needs to be the most or least severe punishment. A further suggestion is that one anchoring point anywhere along the punishment scale is sufficient, because it is possible to ‘project’ from such a point, so as to determine the correlative punishments for all other crimes, and so derive a complete punishment scale. Finally, the suggestion is considered that one can approach the issue of a punishment scale ‘holistically’, denying any distinction between anchoring and derived (or ‘projected’) punishments. We thank Kat Brazenor, Angela Hendley-Boys, Zach Hoskins, Bruce Langtry, Alice Muhlebach, Laura Schroeter, Lucia Zedner and the Journal’s anonymous referees for useful comments and helpful suggestions. Earlier versions of the paper were presented at conferences of the American Law and Society Association, the Australian Society of Legal Philosophy and the North American Society of Social Philosophy. The financial support of the Australian Research Council is gratefully acknowledged.